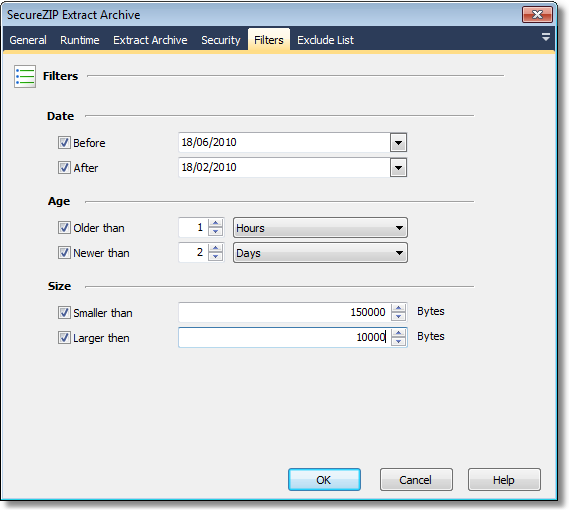 The SecureZIP Filters page can be used to specify the criteria that items have to meet before they are selected when creating and extracting archives. • Date - Select files based on the date that they were last modified. o Before - Files that were modified before the specified date. o After - Files that were modified after the specified date. • Age - Select files based on their age. Specify a value and a unit. o Older than - Only select files that are older than the period specified. o Newer than - Only select files that are newer than the period specified. • Size - Select files based on their size. o Smaller than - Only select items smaller than the specified number of bytes. o Larger than - Only select items larger than the specified number of bytes. Note that if the filters are set in a way that no files meet the criteria the action will fail. Before using Date filters make sure you have specified the expected date format on the options page. For more information on specifying the date format click here.